Ecotourism is an increasingly popular form of tourism in which tourists seek out wild and scenic areas such as rainforests or mountains for an active and educational trip. The tourists are usually from the North America, Europe or Australia/New Zealand; their destination is often in the developing world. Ecotourism has also become popular among people interested in both environmental conservation and sustainable development. It has been called a way to save the rainforest and a "win-win development strategy for undeveloped rural areas." In many situations, however, ecotourism fails to deliver on its promise. Many researchers have studied ecotourism's failures as well as its successes. In this game, you can try your hand at developing an ecotourism project in the Amazon. Can you make ecotourism sustainable? Good luck! 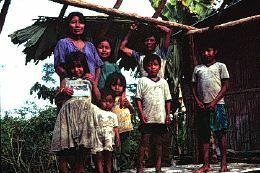 You and your family are Quichua, an indigenous tribe of the Ecuadorian Amazon. You live in a community of 100 Quichua on the banks of the Río Pangayacu, near the Río Napo, an Amazonian tributary. Your community is also called Pangayacu. There are other Quichua communities in the area, but you must travel by canoe to reach the nearest town. Your parents and grandparents used to survive by hunting, fishing, and growing a few crops like plantain (right) and manioc (below) . But times have changed. You now spend most of the day in the fields growing coffee, maize (corn) and rice to sell at the market. Many years ago your land was covered with tropical rainforest, but in the past decade your family cleared 10 of your 15 hectares (25 of 40 acres). You need this land for crops, but you are also worried about losing the rest of the forest. Tourists from North America and Europe have begun showing up in your community. They seem nice enough, but no one likes guests arriving uninvited. Some people say the community should avoid anything to do with tourism. Tourists, these people say, interfere with daily life and tempt the youth with their city ways. But your neighbor Agustín and several other members think that the community should develop an ecotourism project. That way, tourists would come on organized tours and the money they spend would benefit the people who live here. It might also bring in enough money to replace some agricultural income, so no one would have to clear more rainforest. This pile of plants represents how much primary rainforest your community has left. Currently about a third of all community land is forested. This pile of coins represents household income. Currently each household earns about $600 a year. You and the rest of the community have to decide what to do. Will ecotourism help preserve the rainforest? Will it bring in money for food and other goods from the market, school supplies, and other necessities? Or will it interfere with daily life? Copyright 1996 Educational Web Adventures. All rights reserved. In Search of the Ways of Knowing Trail An immersive adventure in Africa's Ituri Forest. Marine Reserves: How do you fit in? Check out these and more Web adventures about art, science and social studies, at: Educational Web Adventures!